I have listened to Bach’s St Matthew’s Passion for 30 years now. I must own a dozen recordings of it, and know at least thirty different renditions of it. The best, without a shadow of a doubt, is Claudio Abbado’s — no one does the arrest in Gethsemane with anything close to his heart-arresting drama — but this, Karl Richter’s, has a finale (track 17) whose beauty remains, to my mind, unmatched. I have just now listened to it 12 times through and, as I type this, I am listening to it the thirteenth time, tears welling in my eyes as if I were 17 again. In the last thirty years — how many times have I heard it? A thousand? More. Three thousand? Certainly not less. As a young man, I lost my faith while listening to it: why, oh, why, I reasoned, would anyone visit this sort of death upon anyone one — himself included? When I cry over it, is it for my youth’s faith? In the year 1700, the God-Incarnate on Earth — Hare Krshna! Hare! Hare! — Johann S. Himself — then a mere boy of 15 — traveled on foot, hitched cart, and boat all the way from Eisenach, Upper Saxony, to Hamburg on the Sea, a journey of several weeks in those days, in order to hear him play the organ. History, says Braudel (1), is circular; the story of Divine Revelation ever repeats itself: the event is perhaps best described as a sort of cross of Young-Jesus-among-the-doctors and Jesus-meets-John. (Lord I am not worthy, etc.) 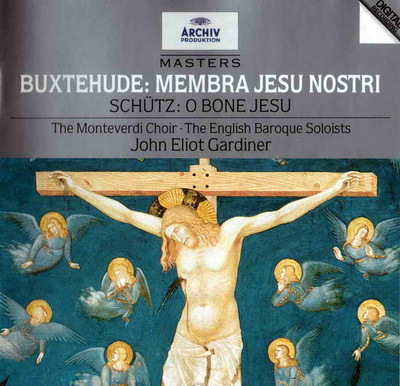 Today, by going here – a journey of a split second — you can hear Buxtie’s Membra Jesu Nostri — Limbs of Our Jesus –in a wonderful performance by the Monteverdi Choir under John Eliot Gardiner. For years it has been a cool thing among my friends to refer to the conductor as John Idiot Gardiner. I suppose I needed to reach my present advanced age to begin appreciating his work. I do not know by name any of the soloists in this wonderful recording: to my great surprise they turn out not to be Emma Kirkby or Paul Eswood. But you wouldn’t know it by just hearing it. Boy, has Poland come up in the world while I have been away. You know now, I suppose, where I will be — come next Easter, don’t you? (1) Nonsense, of course. Braudel says no such idiotic thing.